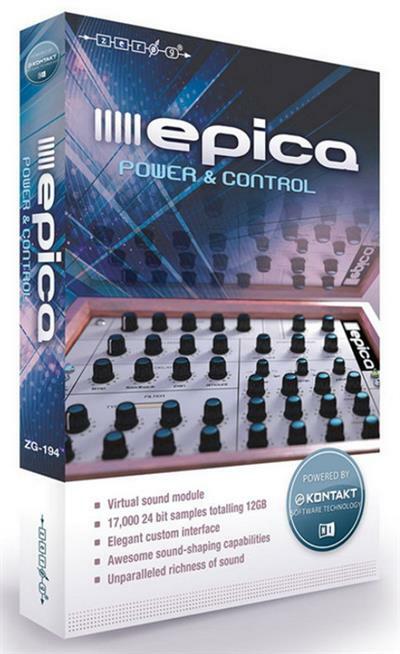 EPICA comes with a stunning interface powered by the latest Native Instruments Kontakt software that gives the user amazing sound-shaping capability. You only need the FREE Kontakt 5 Player to use EPICA, but it is of course also fully usable with the full version of Kontakt 5. Over 17,000 24bit samples have been hand-edited, looped and multi-layered to produce an unsurpassed richness and authenticity of sound that will have your audience gasping in appreciation. EPICA comes with over 600 patches of pads, leads, basses, sequences and fx and of course it has the sound-shaping capabilities for you to create much more. We really believe this is the best sounding virtual instrument we have yet created. EPICA's samples have all been recorded through an equipment chain of 100% boutique hardware with no plug-ins used in the creation of the source sounds. We wanted to create a library that offered a fresh palette of sounds which were rich in timbre and had their own character, so that it would set your music apart from the masses. The User Interface was designed to give you full control over a huge amount of sonic sculpting options without slowing down the creative process. It is both quick and simple to use but devastatingly powerful when you want to create your own presets... which you will find yourself doing within seconds. Most virtual synths have lots of gimmicks but need a lot of work to make them fit into a mix and often sound weak and artificial. EPICA however, sounds great straight out of the box. There's no need to reach for that EQ, compressor, or other plug-in, EPICA just sounds so good on its own!